I think that on Beyond the Wall the singing, the expanded group (including Hutcherson), and the Eastern elements take it well beyond the typical Coltrane tribute or update. "But, at the same time I wouldn’t walk up to any musician and say, You know who you sound a lot like?" Indeed, exactly my point. "Adventurous," of course, can be hard to define--just as we bandy about such words as "creative" and "deep." I think I lost some of my interest in Branford because he has been so locked into the quartet format for a long time. Why not expand ore reconstitute? Fair enough, but I wouldn't find really close similarities, and a record like Beyond the Wall is to my ears much more adventurous than anything I can think of by Branford. Curious that you say of Branford and Kenny Garret, "I find no real differences between he and Branford." Isn't this saying they are essentially the same? Is that a compliment to a jazz musician? That would be good. I tried to get as close to what he said as I could, given my sometimes faltering memory. But I can say that I did a double take when I read BM's words on Miles. I too saw the VSOP group with Branford and Wynton out in front of Miles' classic 60s rhythm section--and curiously enough the then-current Miles band was on the same bill. I did enjoy the show quite a bit. But I'm thinking that Herbie, Ron, and Tony had nothing to teach the young lads. I mean just nothing! I had a look at the current Downbeat while at the library. Branford Marsalis gets the cover story, and in the interview he gets pretty controversial--to my mind. Specifically, he thinks Miles was already an old man in the 1960s and that Herbie, Tony, Wayne, and others were the innovators who brought in the exciting new stuff. The point here, ALL OF IT! He says this: "Miles didn't teach them anything. Nothing." So what happened to the idea of the old master teaching the young ones, while (I'm sure also learning from them)? The usual notion is that Miles developed and nurtured--albeit in a somewhat eccentric way--young talent throughout his entire career. 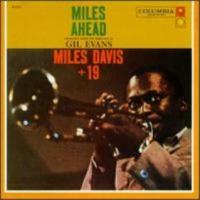 I've read stuff by Herbie where he expressed his complete awe of Miles. I'm learning some things here. I don't know anything about Eddie Costa. I have heard the name, but that's about it. I had not known that Elvin recorded with Yusef Lateef. Track #2 features a pianist with a nice touch, though the approach does not seem very adventurous. A lot of possibilities here; I would not hazard a guess. Track #3 is an odd one. It's like 1950's Miles coming out of one channel and 60's/70's avant garde out of the other, with no attempt to meet one another. Track #5 sounds like Sonny Rollins in a trio setting, though probably not--it could be a very good imitator. The drummer could well be Elvin Jones, though he seems to have a lighter touch. Track #6 is an alto? Not sure. It has a Classical music feel, not that your hear sax (spotlighted) over there. No guess. Tracks #7 sounds a lot like Basie, though the guitar solo threw me--Eddie Durham? It even seems to shift into "One O'Clock Jump." Track #8 is definitely "Afro Blue." Nice work on the drums to open up. Good groove in a fusion style. Some of the guitar work reminds me of Scofield. So It's the Allmans? I know the band's early work pretty well, and much of it is great. This is attaining nearly the same level, and it's jazzier. Track #9 is old time jazz with R&B flavor. This is stuff that must have influenced early rock 'n roll. My first thought on #10 is that it's very early Ellington. I've heard my share of this stuff, but can't identify the number...if it is Duke. Track #11 features a locked-in trio, and the pianist shows the influence of Monk and Nichols--maybe a bit of Oscar Peterson too. I don't know who's doing this, but it's very engaging--my favorite track on the BFT. \ Overall, an interesting and certainly diverse set of tunes. Mark, Concerning Blythe, "Illusions" is short enough, but "Miss Nancy" runs 7 & 1/2 minutes. That's one way to make a challenging BFT. Two compositions by Tyner, one by Henderson, one by Ron Carter--plus several standards. Fine record. McCoy was producing a lot of good/great records in this period, in every format from solo to big band.